Organic. 23 ingredients. No refined sugars. Wheat-free. Great taste gold - 2011. Soil Association Organic Food Awards 2013 - gold. High fibre. Whole grains. Clean ingredients. No artificial anythings. Non-GM. Vegetarian Society approved. 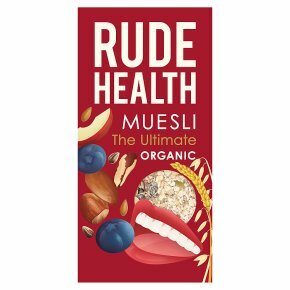 Kosher - KLBD.Why make a muesli with 23 ingredients when most have fewer than 12? Because it means that every spoonful is different. Sometimes you get some plump blueberries with a bite of Brazil Nuts and Almonds. Sometimes you get soft Apricots and tingly little seeds. We've even made the grains interesting. There's no wheat, just Quinoa, Oats, Rye and Barley Flakes to make it light and crunchy. After this, other breakfasts are going to seem a bit dull. Sweetness from fruit, not refined sugar The fruits in this breakfast bring so much more than natural sweetness; they release energy slowly so they won't make your blood sugar spike and crash. Berries give you a variety of flavour bursts, whereas the other dried fruits have their own textures and sweetness. In the meantime you're getting so much that sugar can't provide: antioxidants, vitamins, fibre and a whole riot of tastes. How we like it What could you possibly add to something with 23 perfect ingredients? We enjoy ours with organic milk and crank up Jimi Hendrix's Ultimate Experience as an accompaniment.